Breakfast is one of my favorite meals – not the boring weekday muesli or toast breakfast, but those weekend two-cups-of-coffee, corn-cakes, poached-eggs-and-pancakes-you-don’t-need-to-eat-for-the-rest-of-the-day kind of breakfasts. But, as much as I love these lavish cafe brekkies, I have often wondered why cafes have never expanded their offerings with some breakfasts from around the world and are still stuck in a European-style brekkie rut. Some of my favorite breakfast food comes from the Indian sub-continent with their roti, parsi eggs, idlis, semolina upma, all those fantastic fermented dal pancakes and then, of course, poha – a savoury rice flake pilaf which makes an absolutely awesome brekkie, brunch or a light dinner. Years ago, when I was living in the Blue Mountains, I would occasionally visit Sydney and stay overnight at my sister’s house. One of her housemates would always make me poha for breakfast, which she called ‘Indian cornflakes’. Apart from the flakes, poha has very little resemblance to a bowl of soggy cornflakes, slowly disintegrating in milk, but I’ve always wondered why it hasn’t taken off more as alternative breakfast fare. An added plus is that it’s gluten-free and sure beats a couple of dry old slices of rice bread toast. 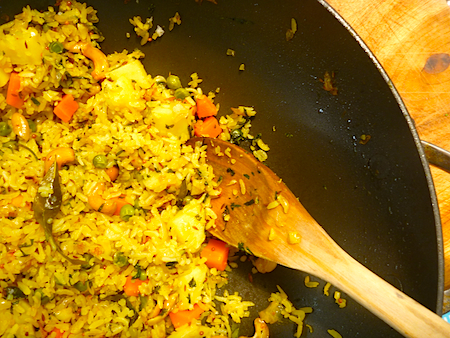 Poha is very easy to make but you will need to track down one ingredient – beaten rice flakes – from your local Indian grocery store. Poha is a a processed rice product where cooked rice is beaten into flakes which have a delicate flavour and distinctive aroma. Make sure you buy the thick flakes and then you will be all set to expand your breakfast horizons. 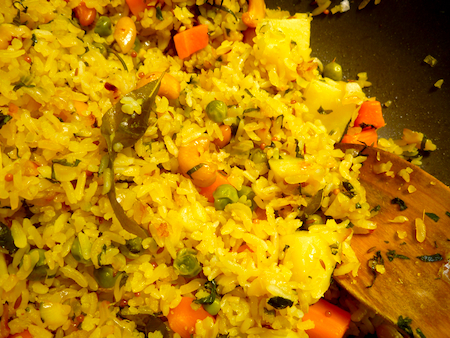 This recipe is more vegetable dense than many pohas, with cashews, potatoes, peas and carrots added, but once you’ve made poha a few times, you realise it is a very forgiving dish and you can build on the basic seasonings and add whatever you have on hand. I like to eat my poha as it is, with maybe a dollop of yoghurt on the side, but you can expand it into a light dinner with a yoghurt salad, pickles and a fresh coriander and mint chutney. Place rice flakes in bowl cover with water and soak briefly for 20 seconds. Drain and set aside. Heat oil in large nonstick pan (I use a large stir-fry pan). When oil is hot, throw in curry leaves, then mustard seeds. When the mustard seeds pop, throw in cumin and let sizzle until it begins to brown. Add the onion, potatoes and carrots. Cook, stirring the vegetables occasionally for about five minutes, then add peas and tumeric, cook, stirring for another couple of minutes, then cover pan and cook for another ten minutes until the vegetables are just cooked and tender. Add beaten rice, coriander, salt and stir through well. Cover pan again and cook on a very 15 minutes. Uncover sprinkle with lemon juice and fluff up pilaf. Serve with extra lemon wedges and coriander to garnish. I am all for expanding breakfast horizons. Thank you. Love the redesign of the blog too! I’ve upgraded to cut out the ads so it makes it a bit less noisy. This makes a really great breakfast. This looks like a recipe I have got to put on my must try list! Yum!